UK based Prism Sound, the global leaders in professional digital to analogue converters, is bringing its domestic Callia DAC to AXPONA room 366, the largest high-end audio show in North America, to give visitors the chance to experience studio quality audio at the show and in their home. Callia, a PCM and DSD capable DAC, pre-amplifier and headphone amp, provides the sound quality from the professional recording studio in the home environment. The state-of-the-art unit is designed for use in no compromise high-quality home audio systems, by audiophiles who want to hear their music the way it is meant to sound. 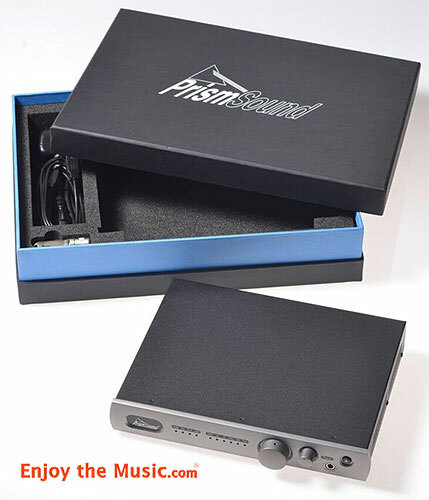 It offers inherent flexibility with an impressive array of high resolution inputs, including: USB (up to 32-bit/384kHz), Coaxial RCA Phono (supporting S/PDIF and AES3 with suitable adaptor) and S/PDIF optical. Callia offers both balanced XLR as well as unbalanced RCA phono analogue outputs. The output volume can be set via the front panel control in order to use the Callia as a pre-amp straight into a power amp, or optionally fixed for use with integrated and pre/power combos. The high quality DAC circuits are identical to the ones found in the company's professional Lyra, Titan and Atlas recording interfaces, to deliver stunning resolution and detail, allowing music to be reproduced exactly as it sounded in the studio. Now listeners at home can enjoy music played on a device designed by the same Prism Sound engineering team, with the same attention to detail and transparency that the world's top artistes, engineers and producers rely upon. For fans of DSD, its credentials are without equal, since Prism Sound's professional ADA-8XR has long been the DSD conversion tool of choice in many of the world's top SACD mastering studios. Using similar architecture in the Callia makes it the perfect choice for DSD reproduction in the home. To demonstrate the Callia, Prism Sound will be a using a selection of uncompressed music, including some special tracks that can't be heard elsewhere. And, in a rare hi-fi show opportunity, visitors will experience music that has been recorded, mastered and edited using Prism products, by the biggest names in the world's leading studios, and now played back using Prism. Graham Boswell, co-founder of Prism Sound, says, "For over 30 years we have been passionate about music and audio, it's been the driving force behind everything we do at Prism Sound, putting us at the forefront of A/D and D/A converter technology. That's why artists like Sting and Mark Knopfler rely on our products, as do so many of the world's biggest studios and names. With so much of our favourite music and movie scores having been recorded, mixed or mastered using Prism Sound converters, the logical next step was to bring our acclaimed levels of quality and transparency into the home." He continues, "With Callia, the music lover can now benefit from hearing their recordings in exactly the same way as the original artiste, engineer or producer heard them. Callia pushes the bar higher for digital audio reproduction and we are very pleased to be able to share our passion with the audiophiles at AXPONA."